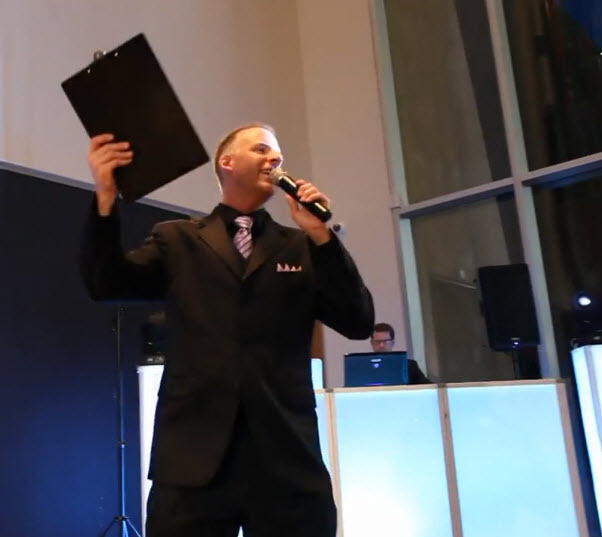 Charlotte Wedding DJ (Brian Hines with ATG Entertainment DJ Entertainment) rocked The Mint Museum Uptown Charlotte for Nikki & Brandon’s Wedding! Working with Jeremy and Ron at The Mint Museum was fantastic. Todd Murphy who is now over the events at The Charlotte Mint Museum was not on location that day since Ron and Jeremy had it covered. They are very friendly to work with and they work with their clients to make sure that everything is perfect. It was also great working with the Photographers Jere and Ashley. They were very accommodating and their photos should look awesome once completed. As far as ATG – we are a Charlotte DJ Company that not only provides DJ Services, but ATG now also provides event light design as well, which Nikki & Brandon took advantage of. The room was illuminated with a Carolina Blue and White vibe since both Nikki and Brandon went to UNC Chapel Hill – GO TARHEELS! In the place of traditional DJ lights, we brought in concert style spotlights which adds a touch of class which just feels right if you want the best in entertainment. ATG also provided one of our Photo Booths. If you are looking for a Photo Booth in Charlotte look no further as we bring the fun to each event with our Photo To Go www.PhotoToGoNC.com Service.